What movie first rocked your world?, someone asked during a recent dinner with friends. Easy: 2001: A Space Odyssey, said one. Looking for Mr. Goodbar, said another, clearly remembering her fear. Mine was The Wizard of Oz. Never mind the munchkins and the flying monkeys; I was captivated by the black-and-white horror of the dustbowl twister, the gleaming-gold yellow brick road, the brilliant glassy cluster on the horizon that was the first glimpse of Emerald City. So when my nearly-six nephew, also a bit of an obsessive Wizard of Oz movie fan, showed me his latest paintings, all I could think of is: I feel you. I look at the thick column of furious grey strokes going in all directions and immediately zone into his own fearful recollections of that part in the movie as he attacked the paper. That ability to connect the intensity of feeling by the maker to the viewer is the basis of successful art. Wow, I said. I can really feel that. I was thinking how great it would be to feel the twister myself, using ink on hand-pressed paper and maybe actual dust, while he trotted back to the kitchen and retrieved Yellow Brick Road. The field was filled entirely with almost mechanical vertical strokes in different shades of orange, yellow and gold, with intersecting strokes to form a grid that ran off the paper, suggesting an endlessness. Wow, I said again, thinking already how it might look actual road-size, using rollers on stretched canvas. Back he went, returning with Emerald City, and by then I knew this kid was really onto something. Unlike his drawings, which are these days more narratives involving figures and recalled landscapes, or — my current favourite: a bird's eye view of a baseball game — this series was expressed feeling-first. Not so much on telling the story but recalling the feeling, through colour and stroke. Kids have so much to tell us about what not to do when staring at a blank canvas. Maybe not so much with the analysis, the second-guessing, the pre-planning, the systemization. Just attack. Jump right in. Look at each stroke as it's going down and do not bother yourself with committing to spending more than a few minutes on it. You may not feel the urge to let a puppet take over the paintbrush or let your inner Scurvy Pirate out for a song but it's good to wrap it all up in play. Like another friend, a modest but gifted artist likes to say, "I'm just playing." My nephew's paintings remind me not to be so precious about the results. It's about the making, not the amassing. Only the adults care about keeping them. I can see some auntie-nephew collaborations down the yellow brick road. American illustrator and graphic artist Mica Angela Hendricks writes about the world that opened up for her with she began collaborating with her four-year-old. 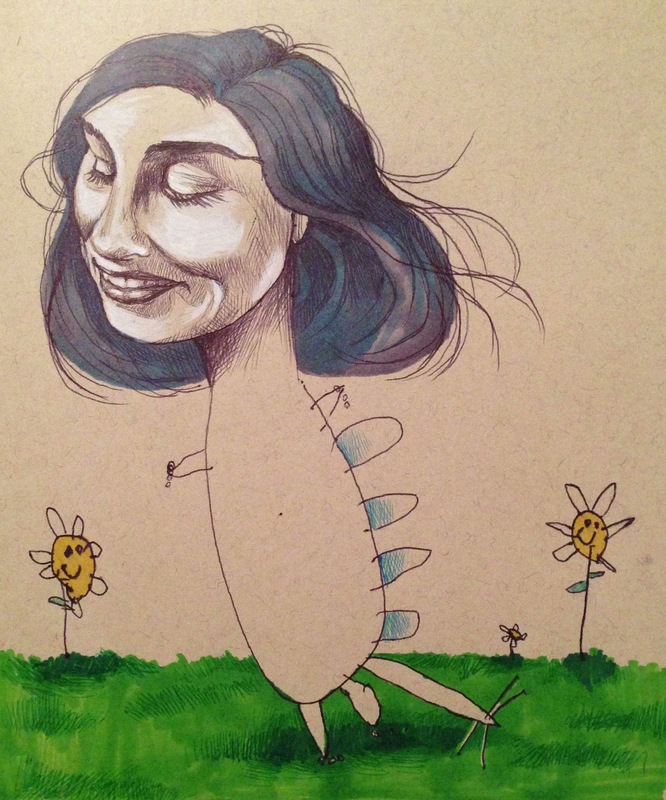 Her blog updates her creative process that is challenged by her daughter with her own ideas. Ignorance was truly bliss when I spotted this staggering, large painting at the AGO last month. I didn't know of the artist, so I viewed it at face value, no back story. It was the only photo I took during my luxuriously long, first-time visit to the Frank Gehry-redeveloped gallery. I needed more Denyse Thomasos. The painting hits as a visual mash-up of Leviathan nightmare and architectural chaos, created with a free, confident, skilled hand. Art can do that: have you gasping in front of what is just canvas and markings. It can rock the centre of your being or reinforce exactly where you sit in the universe at that moment in time. Maybe this is what they mean by having an out-of-body experience. Some post-viewing googling unveiled the tragic news that the artist Thomasos, born in Trinidad and raised in Canada until moving to New York in 1989, died this summer "after an adverse reaction to a dye injected for a routine MRI," according to a statement at the Olga Korper Gallery, where her work has been shown throughout her professional life as an artist. She was my age, recently married, a mother. An important Canadian artist with an international reputation, a professor at Rutgers University in New York CIty, Thomasos has since had many news stories written about her work and her life, interrupted. Her brilliant paintings, which deal with heavy themes ranging from super-prisons to slave ships and rampant globalization, are left to speak for themselves. Almost a year after my final sculpture class with the venerable Liz Magor I'm still wrestling with her challenge to me to find the crack in the beauty. At least once a day I'm confronted with this concept but I only see it in the periphery. I know I'm seeing it when I get that zing, like an endorphine rush. Or sciatica. I see it here in the barnacles-on-oyster-shells my nephew, quasi-niece and I painted with cheap neon paints they brought up to the cabin. It's somewhere in the understanding that barnacles and oyster shells are not to be doused in day-glo, that neon'd natural forms do not belong in a rural setting. It's a subtle sabotage that raises questions, starts conversations. It activates the idea of crack in beauty. I would like to believe I'm able to let go of the 'pretty' and embrace the power of the 'pretty/ugly' but I'm not quite there; the rest of the painted logs and rocks and shells were left outside to dry overnight and the next morning the water-based colours had run, leaving only traces of the neon paint job. Liz Magor would have probably liked that. She might even have made that little 'whoo' sound like she does when she likes what she sees. I chucked them back onto the beach.